Whose Face Is That on the Building on 81st Street in Chatham? 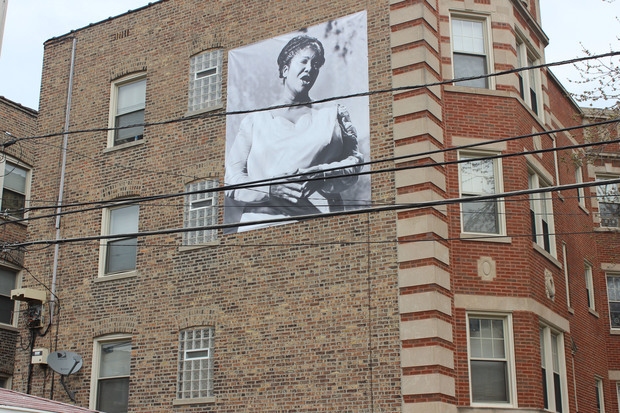 A poster of gospel legend Mahalia Jackson hangs from this building on the northwest corner of 81st and Ingleside. CHATHAM — Mahalia Jackson, the “Queen of Gospel," smiles at Chatham residents each day. She's been gone since 1972, but her face is plastered on the side of a Chatham building. The large black-and-white image was created by artist Chris Devins, who also did a mural in Bronzeville. The Jackson poster has been hanging from a three-story residential building at the northwest corner of 81st and Ingleside since March 19. So why is the legendary American gospel singer’s face on a building? Eiran Feldman, CEO of First InSite Realty, owns the building, along with 300 other properties on the South Side. He said he respects and admires Jackson’s work and wanted to start a movement that changes the stigma some people have about Chatham. The positive imaging campaign, as he refers to it, is just the beginning. “It’s as simple as, I own properties in the neighborhoods, therefore, I’m invested in the community, not just financially, but also emotionally,” he said. He said that many senior residents know who Jackson is, but he’s more concerned about educating the younger generation. The plan is to add a plaque underneath the art piece and two QR codes so that people can scan it with their smartphones. By doing that, their phone will automatically link them to the Internet, where they can watch her sing in a YouTube video or read her biography. Feldman said he plans to keep Jackson’s image up for years and has another site in mind where he will put up two more faces.